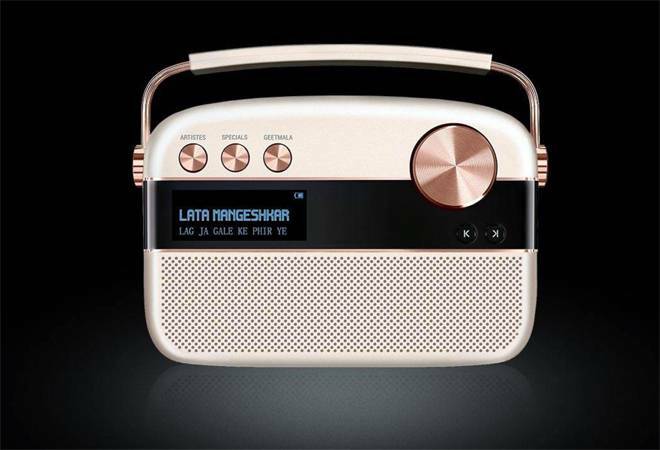 Boasting a champagne gold/rose gold metallic body and an improved sound system, courtesy the Samsung-owned audio brand Harmon Kardon, Saregama Carvaan Gold is the latest top-end variant of Saregama Carvaan digital audio player. It comes with a library of 5,000-plus evergreen Hindi songs. But, it still sports the retro look and provides instant access to great music just like the first Carvaan. The content is rich and varied - you will find a vast collection of songs under artists and genres and the works of all-time-greats such as Lata Mangeshkar, Asha Bhosle, Mukesh, Rafi, R D Burman and Kishore Kumar. You can also access the entire collection of Ameen Sayani's Geetmala besides AM/FM radio support and 130-plus dedicated music stations, featuring Bollywood legends. Although it is easy to navigate using the physical controls on the device or the remote, the companion app makes it more convenient to search your favourite songs or add them to a playlist. The Saregama Carvaan app is available for iOS and Android devices and can be paired with the new audio player via Bluetooth, thus ensuring seamless streaming of your music collection. However, I had to sign in using my Google/Facebook account or mobile number to access the app. Connectivity options include a USB port, an auxiliary port, Bluetooth and a 3.5 mm headphone jack. I was able to access FM and switch between channels using the previous/next button. There is also an external antenna bundled in the box that plugs into the aux port for improved reception of FM stations. One can plug it in and leave it in a corner or carry it around even though it is heavier now at 1.94 kg due to the new audio hardware. Carvaan Gold comes with a built-in battery that takes close to four hours for a full charge and lasted me approximately five hours. Do these features justify the price tag? There was no significant difference in the sound quality when I was listening to the playlist embedded in the device. But high-quality music from other sources such as my smartphone sounded better. One can also consider the Premium variant at almost half the price that supports Bluetooth, pairing with the Carvaan app, FM/AM, USB and aux. Another alternative is to invest in a good Bluetooth speaker along with Echo Input, where one can access most of the songs from Amazon Music with a voice command. ALSO READ:Amazon Echo Dot (3rd Gen) review: Looks Good, Sounds Better!